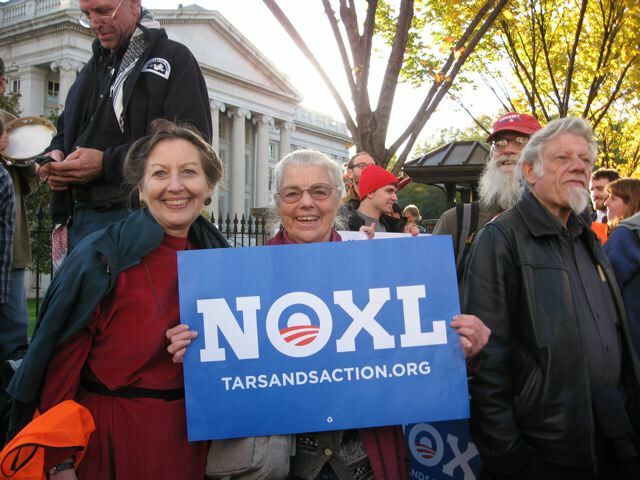 Saying no to the Keystone XL oil pipeline, protesters, including AfD vice co-chair and Defending Water for Life campaign coordinator Ruth Caplan, surrounded the White House on Sunday. More photos from Ruth are here. Meanwhile, Brad Johnson of ThinkProgress debunks the idea that the KeystoneXL project will create jobs in this article. Pipeline proponents throw out all kinds of figures here, from "13,000 union jobs" in the Wall Street Journal (one imagines the "union" part came out through gritted teeth) to “more than 250,000 permanent jobs," according to the US Chamber of Commerce. these tremendous-seeming jobs claims are based entirely on a report by the Perryman Group, commissioned by the pipeline’s owner TransCanada, whose results have been described as “dead wrong” and “meaningless” by Council on Foreign Relations fellow Michael Levi and environmental economist Andrew Leach, neither of whom oppose the construction of the pipeline. Instead, "the only independent analysis conducted of the American job-creation potential of the Keystone XL pipeline finds that between 500 and 1400 temporary construction jobs will be created, with a negative long-term economic impact as gas prices rise in the Midwest and environmental costs are borne," Johnson writes.